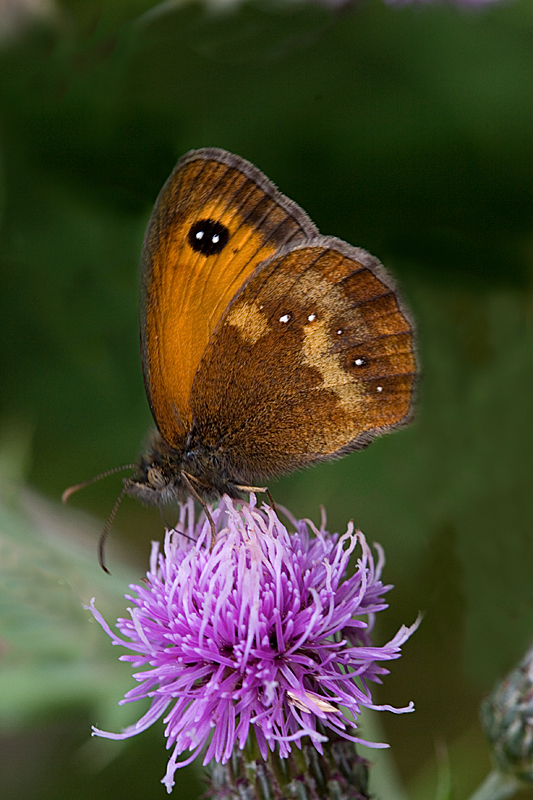 This species, also called Hedge Brown, is most often confused with the larger Meadow Brown, but its wings have a much larger area of orange, with broad grey-brown borders, and a diagnostic eyespot with two white pupils near the tip of the forewings above and below (Meadow Brown's only has one pupil). Flits about hedges and scrub and also nearby grassland, often in very large numbers at the peak of its flight period. The flight period is from early July to August, not often seen in September. A wide range of wild grasses, eg. Bents (Agrostis spp. ), Fescues (Festuca spp. ), Meadow Grasses (Poa spp. ), and Couch (Agropyron repens). Hedgerows, scrub, country lanes, woodland rides etc. All over the county, even in urban areas where there are some overgrown wild places.